He could be the next Ryan McDonagh. At least that was what the good folks at TSN were saying after the Philadelphia Flyers drafted 6-foot-3, 181 pound defenseman Travis Sanheim with the 17th overall pick in the 2014 NHL Entry Draft. Hailing from the small town of Elkton, Manitoba (population: 461), 18-year-old Sanheim’s rise to the NHL differs from many of the other prospects that were selected this past weekend in Philadelphia. One year ago, Sanheim was finishing up his season in Manitoba midget hockey—not even ready to make the jump to junior. He finished this season as the quickest rising commodity in the 2014 NHL draft. Sanheim wasn’t even sure he was going to make the WHL heading into this past season. A couple of years in the Manitoba league with Yellowhead, though, were enough to help him make the leap from midget to the WHL. 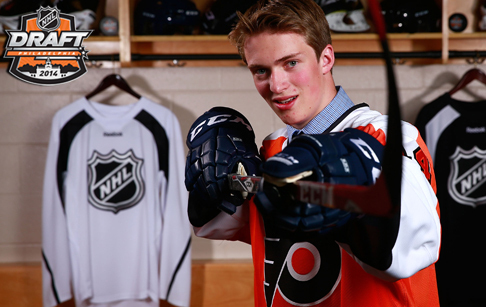 Drafted by the Calgary Hitmen, Sanheim got off to a rocky start in the WHL. General manager Mike Moore noted Sanheim was really hit or miss in the first few months of the season. He was both good and bad. Sanheim had sat as a healthy scratch in four different games during the month of October, something that appeared to motivate him more. When he returned to the lineup, he was gushing with confidence. Sanheim was rushing the puck with ease and used his ferocious speed to draw the attention of scouts at Scotiabank Saddledome (where the Flames play). Sanheim’s offensive numbers began to quickly rise. He finished with 29 points (five goals) in 67 games with Calgary. Sanheim really become on people’s radars when he ended up being Canada’s best defenseman at the Under-18 World Championships in Finland. He recorded five points (all assists) in six games representing his country. Sanheim was the 53rd-ranked North American skater. So why did the Flyers go a little off the board and select Sanheim, when highly touted prospects such as defenseman Tony DeAngelo and forwards Alex Tuch and Kasperi Kapanen were still available? Sanheim has a big frame and is an extremely smooth skater. He was ranked as the eighth-best prospect by TSN analyst Craig Button before the draft. Sanheim sees the ice very well, comparing his own game to that of Blues’ defenseman Jay Bouwmeester. In 67 games with the Hitmen, Sanheim was a plus-25. Sanheim has a ton of upside, especially considering that his play continued to rise during the second half of last season. He just rose and rose. Sanheim joins an impressive group of Flyers defensive prospects, including Shayne Gostisbehere (3rd round), Robert Hagg (2nd round) and fellow first rounder Samuel Morin, who was picked last season at 11th overall out of Rimouski in Quebec. Sanheim (@sanheim17) will continue his development in juniors next season.